This is another first-time author, and I really can't wait to read what's next!! It's just a story of a girl going through some big slump in her life. She takes off on a whim after losing her job, and meets new, interesting characters in a small, faraway town. The characters are all just people in a town, folks I think I know. They seem so real to me. They all are described as real people, there are no ''imperfect beauties" or perfect people. They are all every day folks. The main character actually thinks how I think...sarcastic, funny. I loved the real humor of this book. Not stuff meant to be funny, just the funny things that happen in every day life. I can relate to Bailey so much. She screws up and then makes fun of herself for it, even if she's regretful. She has a best freind who is in love with her. She drinks to much on a few occasions and can even get a little slutty. But this is not how she wants to be, and she struggles to make something more of herself. She also has a family with imperfect, but good, members, just like any family I know!!! The ''golden child'' brother really hit home!!! I loved this adventure. I will most likely read it again. Hi! 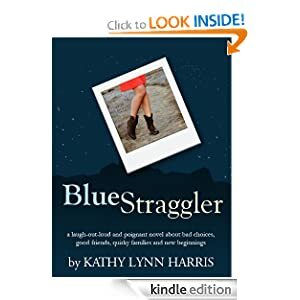 I just saw your post and wanted to thank you for reading my novel, Blue Straggler. I'm so very glad you liked it!